Search by author, title, keywords etc. WATCH THIS LITPICK YOUTUBE BOOK REVIEW VIDEO NOW! 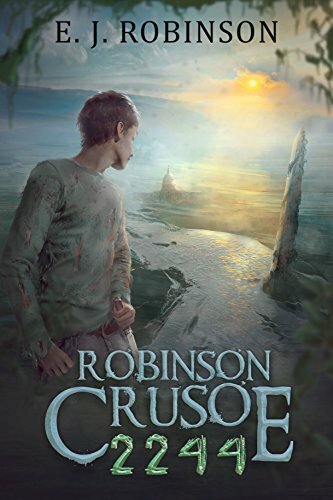 Robinson Crusoe 2244 is an entertaining, fictional, apocalyptic story about a world where nuclear radiation from a great war (most likely World War III) mutates humans and animals into flesh-eating, zombie-like beasts called Renders. The story starts in the last refuge for humans who have not been affected, the kingdom of the OnePeople. Robinson, the main character, has to leave the refuge when he is framed for the murder of the king. The story is about how he struggles to survive in the infected areas which he is forced to escape to and discovers the secrets and corruption of the OnePeople. Along the way, he forges a friendship with a native survivor, a girl he nicknames "Friday." Together, they fight for their lives against the savages. The addition of the savages turned the story from the regular zombie-apocalyptic story to a tale with a challenge that always keeps the survivors on their guard, even if they have a fortified shelter. This story was very original and entertaining for me because it turned a classic story into an exciting, more modern, apocalyptic story that really kept me reading until the very end. The story was, in my opinion, fast-paced and action-packed. However, the characters didn’t really grow or change. Robinson was always going to do whatever he wanted and not listen to anyone. Friday was always going to be stubborn. The descriptions were engaging and refreshing because when the author, for example, was describing buildings like the Washington Memorial, he took the standpoint of someone who knew nothing about the United States. Finally, the survivors used their brains, not brawn, to survive, which allowed the characters to solve the mystery and escape their opponents. Find great books and start book clubs too! Inspires students of all ages to read and review books and to become better writers through our mentoring program. Provides authors and publishers student book reviews and a means to promote their titles worldwide through written book reviews, video book reviews, and social media blasts. Helps teachers and librarians promote reading and writing through book clubs, reading groups, and individualized, personal feedback on written student book reviews.